Saudi Arabia's Crown Prince Mohammed bin Salman, who is also the Gulf nation's defence minister, arrived in India last night on his first official visit and was welcomed on the tarmac with Prime Minister Narendra Modi's signature bear hug. During his 30-hour visit, the Saudi leader is scheduled to participate in bilateral talks on a wide range of issues of mutual interest. Smarting over the February 14 terror attack on CRPF personnel in J&K's Pulwama district, India is expected to strongly raise the issue of Pakistan-sponsored terrorism with the Crown Prince, officials told PTI. The buzz is that the two countries may issue a strong statement on terrorism. 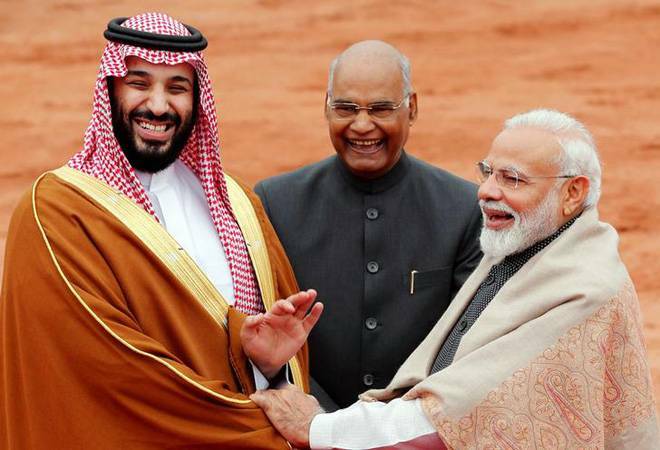 The Crown Prince's visit follows Modi's successful 2016 visit to Riyadh, during which both sides had inked a pact on the exchange of intelligence related to money laundering, related crimes and terrorism financing along with expanding cooperation across diverse areas like trade and investment. The ongoing visit will likely build on these existing ties. The two countries are also expected to look at significantly ramping up overall defence cooperation, including having a joint naval exercise, officials told PTI. Given that India is the world's third largest oil importer and Saudi Arabia is the world's biggest oil exporter, both sides will obviously continue to focus on energy synergies. Although in FY18 Iraq emerged as India's largest oil supplier, Saudi Arabia, the world's biggest oil exporter, remains a key pillar of India's energy security, being a source of 17% or more of crude oil and 32% of India's LPG requirements. "We hope to transform this buyer-seller relationship in energy to a broad-based partnership," said TS Tirumurti, Secretary, Economic Affairs in the Ministry of External Affairs. According to reports, the bilateral talks will cover Saudi Aramco's investment in refineries in India, including the stalled $44 billion refinery in Ratnagiri, Maharashtra. Last year, Saudi Aramco, the Kingdom's state-owned oil company, had signed a pact with a consortium of Indian oil companies -- IOC, BPCL and HPCL - to jointly develop and build a mega integrated refinery and petrochemicals complex in Maharashtra. On Monday, giving in to local and political protests, Maharashtra Chief Minister of Maharashtra Devendra Fadnavis announced that the project will be shifted to another location. Oil may be the biggest import from Saudi Arabia, but the trade basket includes several other commodities. In fact, the Gulf nation is India's fourth largest trading partner and in 2017-18 alone, bilateral trade was worth $27.48 billion. Saudi Arabia also ranked 15th in terms of country-wise foreign direct investment in India globally, second after United Arab Emirate among the Arab countries. Riyadh invested $21.55 million worth in joint FDI ventures in paper manufacture, industrial products, cement, metallurgical industries, computer software, etc, in India between 2004 and 2008, and the investment is increasing every year. Significantly, earlier this month, the Union Cabinet chaired by Modi approved the signing of an Memorandum of Understanding (MoU) between India and Saudi Arabia on establishing a mechanism for investment infrastructure in India. "The MoU will be a step forward in engaging with the institutions of Saudi Arabia to attract a potential investment into the infrastructure sector in the country. It will lead to boosting infrastructure development in the country, creation of more jobs, growth of ancillary industries/sectors which will lead to growth in GDP and overall economic prosperity," read a government statement. Let's not forget, back in November, the Crown Prince had announced plans to invest heavily in India through the National Investment and Infrastructure Fund. This will help in building highways, ports and other big infrastructure projects in India. "During this workshop, Invest India Grid was launched in Saudi Arabia. Invest India is setting up a dedicated team for facilitating Saudi investments in India," said the government, adding that "six working groups have identified 40 investment, trade and business opportunities with vast potential for expansion". According to Tirumurti, both sides are also expected to sign MoUs in areas of tourism, housing and information and broadcasting. Tourism, in particular, is seen to be a mutually-beneficial field. In 2015, Indian nations travelling to Saudi Arabia accounted for 6.7% of the country's total share. Similarly, Saudi Arabia is one of the potential tourist generating market for India from Middle East. So the MoU in this area could be instrumental in increasing tourist footfalls for both nations. Last but not the least, India has been identified as one of the eight strategic partners with whom Saudi Arabia intends to deepen partnership in areas of political, security, and culture. "The single most important agreement that we are going to sign, will be the establishment of the high cooperation council which will be headed by the Crown Prince on the Saudi side and the Prime Minister Narendra Modi on the Indian side. With this, you are going to have direct contact between the two countries. For Saudi Arabia, this type of high cooperation council exists with only US and China. India is the third country. It shows the importance of we give to these countries." Kamel Al-Munajjed, Chairman of the Saudi Indian Business Council, and the head of a 50-member CEO delegation that is accompanying Prince Salman, told Business Today. "As part of this engagement, we are finalizing the setting up of 'Strategic Partnership Council' between the two countries at ministerial level," said Tirumurti. An announcement in this direction is widely expected before the Crown Prince concludes his visit. "We are confident that this will give greater thrust to our strategic partnership and take forward our discussions in a focussed and action-oriented manner," Tirumurti added.